Endless games have traditionally done quite well on mobile devices; titles such as Jetpack Joyride and Super Hexagon have enjoyed critical acclaim and financial success. 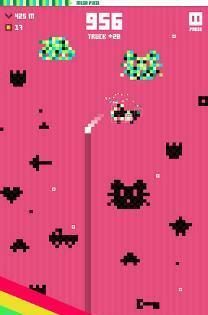 Unfortunately, Mega Dead Pixel is quite a way off reaching the same heights thanks to some very mediocre gameplay. As a dead pixel that has just fallen from a monitor, you are tasked with panting and destroying other pixel shapes during you endless fall. Painting a shape involves falling past it as close as possible without touching it, whilst destroying a shape involves allowing your pixel to hit it directly, which will reduce your pixel size; hit a shape as a one-pixel block and its game over. 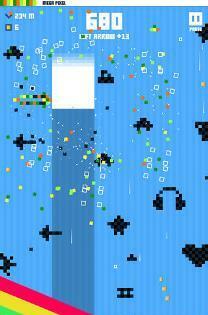 Your pixel can move horizontally across the playing area by tapping or holding the appropriate side of the screen. The screen is made up of a number of different lanes that the pixel can be in; tap once on the right hand side of the screen and your pixel moves one lane to the right. The lanes make it quite easy to line up your pixel perfectly with shapes below in order to paint them. One of the key things with endless games is speed. The speed needs to be fast enough to make it challenging, but slow enough to make it playable. The speed of your pixel depends on how big it is; collecting white pixels increases its size and thus speed. 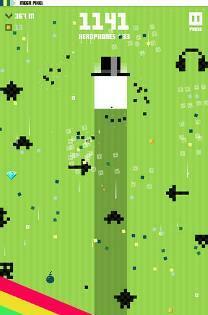 When one or two pixels in size the game is too slow, making it easy to play and score – only stupid mistakes will result in death – however, increase the size to three or more pixels and the speed rapidly increases, making it difficult to play without hitting shapes, which will bring it back down to a slower speed. Speed is also important during the menu sections, one of the reasons Super Hexagon is so popular is because it is so quick to replay; within a second I can see my score, best score and then be replaying. In Mega Dead Pixel this process takes at lest 4 seconds if not more, which sounds fairly trivial but definitely affects the game. The main hook, apart from trying to beat your high score or those of your friends, is collecting coins which an be used to buy more shapes to paint, hats for your pixel and power ups. Coins can be collected by letting your pixel hit them during falls or by completing missions. Missions include tasks such as destroying 100 pixels in a single fall, painting 3 of the same shape in a row or dying between 100 and 200 meters along with many others, but few require a change of tactics. The items that can be purchased with coins are all fairly boring: new shapes to paint offer practically no advantages making them fairly pointless; hats change some of the characteristics of your pixel, such as fall speed or item spawn-rates, but fail to make a massive difference, although a few do slightly fix the speed issues during falls; power-ups offer new ways to destroy pixels. For instance, when collected on a fall some will shoot bullets from your pixel to destroy any shapes below, while others make your pixel invincible, allowing you to smash through anything for a short time. It’s these power-ups that offer the most value, as they actually give a real advantage for high score chasers. Coins are not the only currency – revive tokens are also available and fairly self-explanatory, allowing you to continue a fall if you die. 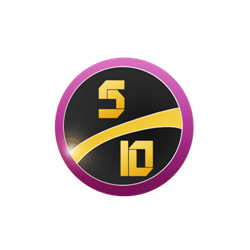 These tokens can be gained by falling a certain distance in game, and do come in useful, especially if you are just off a new personal best. As you would expect in a free game, both these currencies can be purchased for real money. The prices are not unreasonable, but you won’t need to buy any of them. Almost all items can be purchased after a couple of hours’ play at most and there is no real reason to buy revives. VERDICT: Mega Dead Pixel fails to bring any great ideas to the table, and is not particularly fun to play. The gameplay feels unbalanced due to the speed and the main hook of collecting and spending coins offers little advantage or entertainment. The menus are slow and in-app purchases offer few genuine rewards. Mega Dead Pixel is OK for a few hours, but quickly becomes stale.